Festival No. 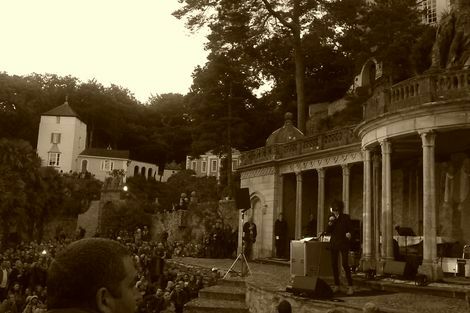 6 returns for a second year, Getintothis’ Peter Guy absorbs the spectacular setting of Portmeirion and a myriad of marvels unfolding within. 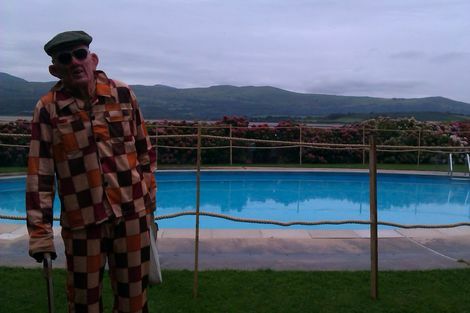 Portmeirion is something to behold. 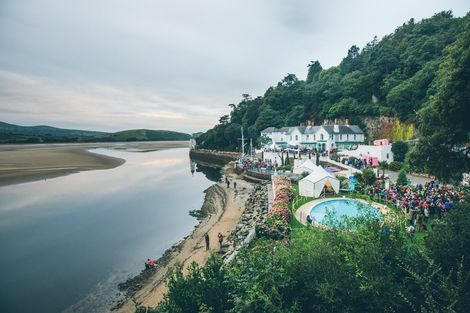 Like Alice In Wonderland reimagined through the eyes of a Surrealist artist, this tourist hotspot tucked into the coastline of North Wales’ Gwynedd is every inch the spectacle. Having spent much of our childhood ferried around the entirety of Frances’ châteaux in the backseat of a Ford Datsun we had up until now been deprived the visual feast of Sir Clough Williams-Ellis‘ creation. Famed for providing The Village setting in the ’60s television show The Prisoner, televisual portrayals could barely do justice to this fantastical world of colour, architectural splendour and natural beauty. Not since our trip to the Disney World on acid, that was Dubai Sound City, had we encountered such a unique world within our world – and here was a place primed for festivities, imagination and music. A place where Arena icons gathered in tiny circular rooms atop of towers to deliver book readings, a place where famed poets recounted tales amid Greco-Roman amphitheatres, a place where Balearic dance playlists mixed with Madonna’s Holiday pumped loudly from within thick forests and winding treetop paths, a place where Rough Trade merch stands sold coffee-table books next to palatial swimming pools alongside an estuary coated with golden sands for as far as the eye could see, a place where giant deck chairs lined grassy banks sculpted into chessboards for young children to undertake their rolls as Bishops and Knights of the realm, a place psychedelic DJs plied their trade inside a boat made of stone that refused to sail, a place where paddle boarders mixed with puppet shows all beneath a colossal Pantheon dome which dominated a skyline sometimes decorated by trapeze artists zooming to earth from giant balloons known as Heliosphere. This was the landscape of Festival No. 6. A landscape truly like no other. What with the British festival circuit awash with unimaginative line-ups, trading on nostalgia and overblown corporate reliance, Festival No. 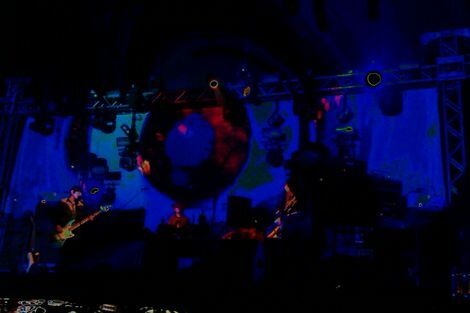 6 captured the fine balance between engaging environment, boutique culture and intelligently curated music. With lashings of fun to boot. Indeed, intelligent but cannily-crafted guitar pop was to be a theme of the weekend with Dutch Uncles catching our attention early doors on Friday; a mixture of angular riffs married to Duncan Wallis‘ jerky vocals/keys/body thrusts proved a mini revelation. All this despite their key ingredient: couscous – which had spilt from a broken percussive shaker in the airport. Still, they weren’t half tasty. Similarly mouth-watering were fellow Mancunians, MONEY, who following their superlative set in Liverpool’s Leaf Tea Shop overcame persistent sound problems to deliver divine echo-laden vocal howling and guitar-driven crescendos in equal measure. Jamie Lee‘s obvious frustration with the technical worries only added to the sense that anything could happen on stage – was he going to smash the stage up, clamber into the audience, kick off at the sound guys? No, he simply chuckles, throws his instrument up into the air and lets out a cry of beautiful thunder. Trips to the exquisite Estuary Stage allowed us to soak up Temples‘ scuzzy retro stomp and spangley pantaloons while up in the Woods our first acquaintance with Liverpool’s three dozen musical representatives, By The Sea, managed to drown out the heavy drizzle with frazzled Autumnal fury – Waltz Away sounding particularly glorious amid the thick foliage. We’ve a long affinity with Badly Drawn Boy, our copy of The Hour of the Bewilderbeast has pretty much lost all it’s grooves after one too many spins, yet his mid-afternoon set paled alongside the young guns on display; even Once Around The Block sounded a tad flat by comparison. Taking in more of Festival No. 6‘s quirks – male voice choirs amid the Piazza, gorging on chocolate brownies from the indie food market, Huw Stephens DJ-ing in the Welsh-only music tent, late evening karaoke – ON A TRAMPOLINE – in the forest and exploring the Prisoner set, we find ourself somewhat lost in a daze and it’s not until we stumble back into the main arena and the slam-dunk of Everything Everything‘s Cough Cough kicks in that we’re back in the game. E-E have somewhat perfected the tangled guitar pop peddled by so many of UK’s current crop, and where 18 months ago they lacked the power to drive home their recorded output, they now sound ridiculously big. And it’s reflected in the mass-singalongs and bouncing main arena tent with Kemosabe providing one of the weekend’s monster blasts of sound. 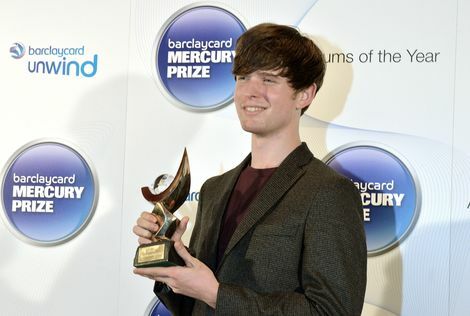 Speaking of blasts of sound: James Blake. A curious first night headliner, Blake confounds and captivates in equal measure. The opening salvo of his performance relies on gradual builds of bass and glistening liquid-like understated electronic melodrama and we’re head over heels sold. Set zenith arrives with a stunning rendition of Limit to Your Love which, despite the giant tent surrounds, manages to transport you to somewhere far cosier and we’re lost in the moment. Yet, this is to prove the peak of a set which arcs dramatically downwards as track after track of middling electronic melancholy not only serves to nullify any excitement but also underlines this prodigious talent hasn’t quite the sonic armoury to headline such an occasion. Yet. Not even thunderous womp-bass-boings to the belly can rouse us. 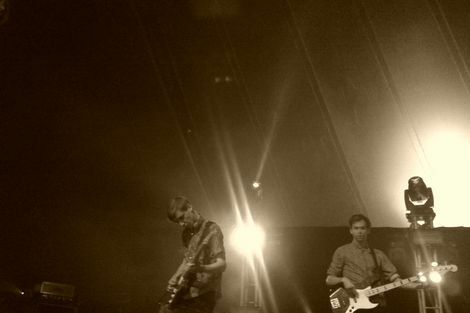 We, like the many others, about turn and join a rather excitable Late Night Pavilion for the remainder of Jagwar Ma. For two tracks we’re mildly entertained but there’s far too much reliance on retro-pastiche for us to be overawed and despite an uproarious reaction from those around us, we can’t help but feel, like their Aussie contemporaries Tame Impala, that they’re doing a corking job at reprising Brit relics and selling it back to us on the cheap. Most music sounds great after eight rounds of rum cocktails, but Andrew Weatherall is something else. His set in the Clough Stage doesn’t mess about; channelling late-night levels of delirium which NEVER relent it takes but five minutes of a middling Frankie Knuckles set over in the adjacent tent to have us scurrying back for more to close day one on something approaching burn out. The Saturday hangover is tempered by two poached eggs served up in a tent with 1970s literature informing us how to ‘deliver the perfect punch’. We kid you not, an organic produce tent with bibles on Kung Fu and 70s fight club. There was a body-blow just around the corner when we’re told Hookworms had pulled their midday set (due to illness) and we’re left skulking off to the Village to be gently eased into the day by Tim Burgess‘ Telling Stories session; a characteristically fine Festival No. 6 vignette as The Charlatans frontman recounts tales inside a circular haven to all manner of folks – all the while the bands play on in the distance. Our introductory aural delight on day two arrives in the form of jazz-Santana sledgehammers Melt Yourself Down who manage to reimagine Mars Volta‘s hysteria but condense the prog tendencies into four-minute Sax-laden magic. They’re batshit brilliant. The aforementioned Liverpool love-in unravels with an Outfit–Stealing Sheep–Bernie Connor–Clinic–Harlequin Dynamite Band quintuple whammy as Portmeirion is fast-transformed into a who’s who of Liverpool. Outfit sound particularly glorious on the bigger stage with Nick Hunt‘s guitar sent into overdrive on Elephant Days while Thank God I Was Dreaming is leant a club-like euphoria. But it’s left up to Harlequin Dynamite Band to ram home the ‘Liverpudlians have landed’ vibe taking up an entire lane in the village with their assortment of drums, bells and whistles causing congestion on the streets of Wales. Former Black Grape frontman Kermit delivers an oddball ‘poetry’ reading in the Piazza which is as endearing (he talks often, and in detail of the fallout from his addition to crack) as it is naff (the readings little more than GCSE rhyming couplets) and he’s soon followed by the renaissance man, John Cooper Clarke, who despite being omnipresent in the world of arts, music and TV adverts relays one of the performances of the weekend. His wit, supremely affable nature and quite phenomenal lyrical flow gushes forth in a stream which tickles your senses, sending us into a mini state of rapture. Astonishing stuff. Equally astonishing is Bill Ryder-Jones. Slotted into an early evening Estuary Stage billing, the Wirral musician is the embodiment of restraint and understated – almost mystical – wonder. The large hushed crowd soak up 40 minutes of material in quiet reverence; stand out The Lemon Tree #3 the embodiment of his skill – insouciant melodies, delicate orchestration and a cracked, huggable vocal. Perhaps our surprise of the weekend arrives in the spindle shape of Lianne La Havas who’s beaming smile and arresting presence is matched by the breadth of her seismic vocal. 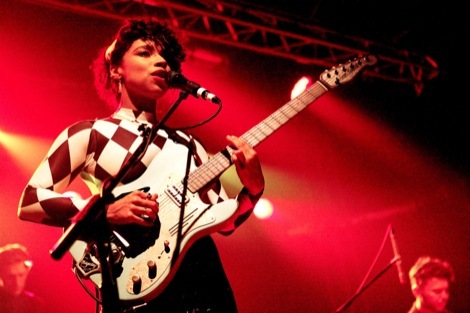 Tempered by deft guitar fills and the kind of backing band Prince would be proud of, La Havas had us scratching our heads at how we’d managed to allow her to fly under our radar for so long; sure we knew about her – who couldn’t have been walloped round the chops by Is Your Love Big Enough? – but live, tracks like Forget, are transformed into mammoth walls of R&B magnificence. 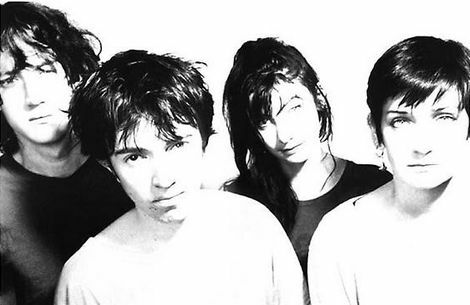 Speaking of mammoth: My Bloody Valentine. Reams have been written about Kevin Shields‘ sonic juggernaut, yet nothing can prepare you for the sheer weight of the battering. Often at festivals the live musical force can be lost due to muddied sound – not least due to adverse weather – yet here, under cover and amid a finely tuned mix, MBV are the personification of a musical natural disaster; remorseless, destructive, epic and simply staggering. Chief proponent is Colm Ó Cíosóig who’s multi-limbed percussive pummelling rarely relents. For 90 minutes his dexterous drum rolls guide Shields’ white-noise like incoming tidal waves; rising and falling amid a wall of Debbie Googe bass rumbles and Bilinda Butcher mellifluous harmonies. It has the visceral, overwhelming effect of SWANS yet the distilled ambient thrill of Stars of The Lid and by the close we’re left drained yet ecstatic. Alas, it was to be our final slice of live action as a genuine force of nature curtailed proceedings a day early as our tent (and pretty much everything in it) was blown away and the contents left sodden as the North Wales gales and rain sent Portmeirion into lock down. 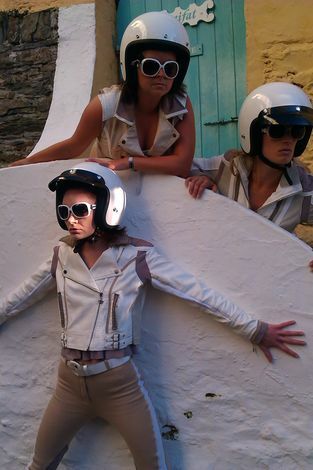 With stages shut and a mid-afternoon site assessment in the offing we called time on an unforgettable experience, promising to return for the full Festival No. 6 hit next year. 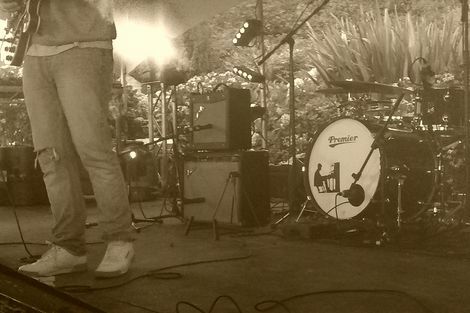 Getintothis‘ Merseyside music’s top 25 tracks of 2013 so far. Liverpool’s gig calendar 2013: Guide to essential gigs not to miss the rest of this year. 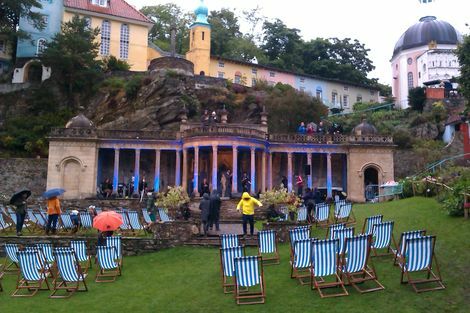 Festival Number 6 2013: Six of the best from Portmeirion’s Welsh wonderland line up. Liverpool’s Abandon Normal Devices (AND) Festival 2013: Guide to what’s on during art, digital and cinema festival. 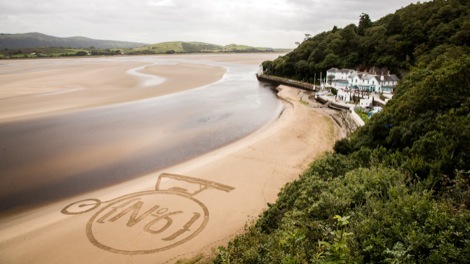 Main image by Danny North, remainder by Getintothis’ Peter Guy.